The Empathy Library is the world’s first online empathy collection and a treasure house for catapulting your imagination into other people’s lives. What might it be like to be a child growing up in Tehran, or to be born without sight, or to be a soldier fighting someone else’s war? The library takes you on these journeys into unknown worlds. The library is full of recommended books to read (fiction, non-fiction and children’s books) and great films to watch (from feature films to documentaries and video shorts). Their common thread? The power to deepen our empathy – to help us step into the shoes of other people and look at the world through their eyes. The library offers a unique form of armchair travel that can give you a taste of a different culture, a different generation, a different life. How exactly can you use the library? You can browse Top Ten rankings of the most popular books and films, or search by themes (like love, war or religion), or for writers and directors who interest you. While we can’t lend you the books or movies themselves, you will find everything you need to know about them, including reviews and helpful links. You might come across books like George Orwell's Down and Out in Paris and London and Toni Morrison's The Bluest Eye, or films such as Gandhi and Avatar. But don’t just visit the library – join it too. Library members can add their own favourite items to the collection, and comment on and rate existing entries. The position of an item in the ranking charts is based on the star ratings given by members of the Empathy Library. The library is founded on the belief that empathy can transform both our own lives and the societies we live in. As the novelist Ian McEwan put it, 'Imagining what it is like to be someone other than yourself is at the core of our humanity. It is the essence of compassion, and it is the beginning of morality.' There is now plenty of research showing that books and films are a great way to help us make the imaginative leap of empathy. The library provides a host of ideas for reading groups, film clubs, and empathy projects in schools, community organisations and workplaces. And it’s also somewhere you can go to find a fantastic book to read to your kids, or a classic movie to watch on a Friday night. We are grateful to the following Friends of the Empathy Library for their support: The School of Life, Roots of Empathy education programme, Ashoka's Start Empathy initiative, Friends of the Earth, Stand in My Shoes and Rider Books. 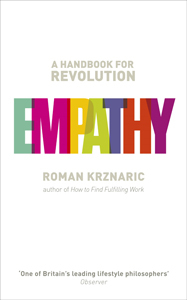 The Empathy Library has received media coverage around the world, including: BBC Radio 5, Yes! Magazine, Christian Science Monitor, UTNE Reader, Ashoka’s Start Empathy blog, The Bookseller, Revista Galileu and Porvir in Brazil, NationSwell, Stichting Beroepseer in the Netherlands.